The latest leg of the WSOP International Circuit has recently kicked off at Sydney’s The Star Casino and three players have already collected gold pieces and first-place payouts from the popular series. And there is yet so much more to come as the WSOP International Circuit will run at the popular gambling venue all the way through December 17. WSOP Circuit poker festivities kicked off at The Star with a A$450 Opening Event. The tournament took place on November 27-December 2 and featured multiple starting flights and a few more days of play. It drew a massive field of 1,444 entries who generated a prize pool of A$649,800. There were payouts for the lucky top 153 finishers, cashes starting from A$870 and going all the way up to a top prize of A$112,171. Jun Wang outplayed the tournament’s behemoth field to collect that top prize and an accompanying gold ring. 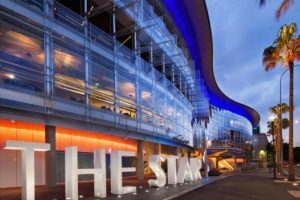 A A$360 buy-in Ladies Event was the next one to be completed at The Star. That tournament drew a field of 70 entrants who generated A$25,200 for the prize pool. Victoria Boast emerged victorious to collect A$8,820. Last but not least, the single-day Turbo Event with a A$500 buy-in was completed earlier this week. It saw 327 entrants pay up the buy-in fee to register into it and play for a cash prize and a gold ring. Jarryd Godena was the lucky one to take down the tournament and grab the lion’s share of the A$163,500 prize pool. The player’s first-place prize for topping the event’s field amounted to A$38,422. One of the most exciting tournaments within the WSOP International Circuit Sydney’s schedule has just kicked off at the host venue. The two-day A$5K Challenge is expected to draw quite some interest from players with its guaranteed prize pool of A$1 million. Its winner will be determined tomorrow, December 6. The A$2,200 Main Event is scheduled to kick off on Friday. The tournament will feature four starting flights and three more days of play until a winner is determined on December 17. Participants will contend for a share of a A$2.1 million guaranteed prize pool, which will most likely be crushed. 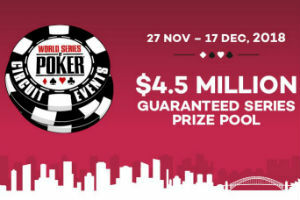 The A$20,000 High Roller is yet another highly anticipated tournament that is set to take place as part of the WSOP International Circuit Sydney. The event will run on December 12-13. Interested players will be able to enter directly into it or to win a seat via one of the several satellites. There will also be satellites into the Main Event in the days ahead of the highlight tournament.